Notes: Plessey is at the very margin of the deep coal mining area of south-east Northumberland. Small coal mines operated near Plessey Checks and New Houses, but they had ceased production by the early nineteenth century and they left little trace on the landscape. Numerous larger shaft mines with their attendant pit-heaps (the man-made mountains of waste materials) and sprawling villages of terraced housing dominated the landscape as close as Cramlington and Dudley, but into the twentieth century Plessey remained a rural agricultural area with scattered farmsteads. In the station’s later days some opencast mining was carried out a short distance to the north and south – see the OS 1953 map; and since the station closed, the rural isolation has been lost as further opencast coal mining and the expansion of Cramlington’s industrial estates have transformed the landscape. Only to the north are there still quiet fields. There is now no village of Plessey, but a ‘deserted medieval village’ site has been identified about ¾-mile north-west of the former station, just east of Plessey Hall Farm. The name is carried by a few other buildings in the locality as well as by the attractive Plessey Woods (now a Country Park) in the valley of the River Blyth over which the East Coast main line passes on a viaduct. 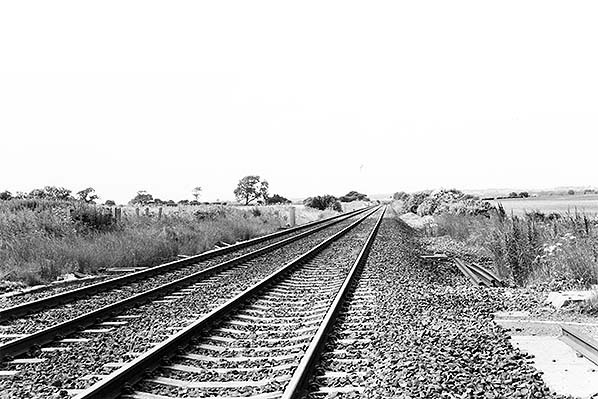 When the Newcastle & Berwick Railway opened in 1847 a handsome building was provided immediately north-west of the Shotton Lane level crossing, on the down side of the double track, where Plessey station was later to open. The building was similar to that at Forest Hall which, like Plessey, did not operate as a timetabled passenger station until the 1850s, and it was larger than most of the crossing-keepers’ cottages so the intention might have been to handle goods traffic there or eventually convert it to serve as a fully-fledged station. It is likely that platforms were installed to allow market trains to call prior to the appearance of the station in Bradshaw of July 1859. Early public timetables gave the name as ‘Plessy’; the working timetable called it ‘Plessay’. From 1864 the spelling ‘Plessey’ was used. The main building was distinctively Newcastle & Berwick in style. It was of two storeys, constructed of sandstone ashlar. A gabled section facing the platform boasted a canted bay on the ground floor, and a ball finial provided decoration above the raised gable. Prominent triple chimneystacks were at the north-west and south-east ends of the building. A small pitched-roofed timber building was added adjacent to the crossing. 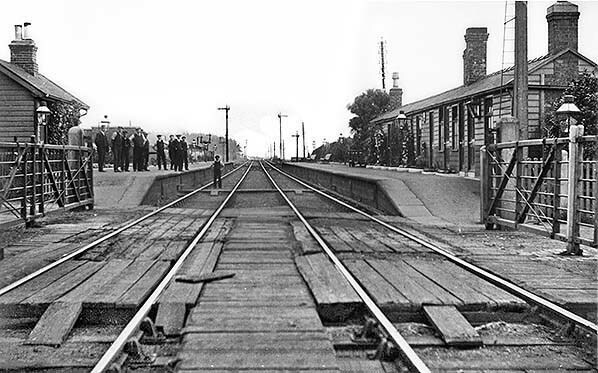 On the opposite (up) platform, again adjoining the crossing, was a lengthy single-storey timber building with a pitched roof, which contained waiting facilities. Throughout its life the station was oil-lit. By March 1874 a signal box had been built on the down side, south-east of the level crossing. Two sidings were shown at Plessey in the LNER diagram of the line drawn in 1934. 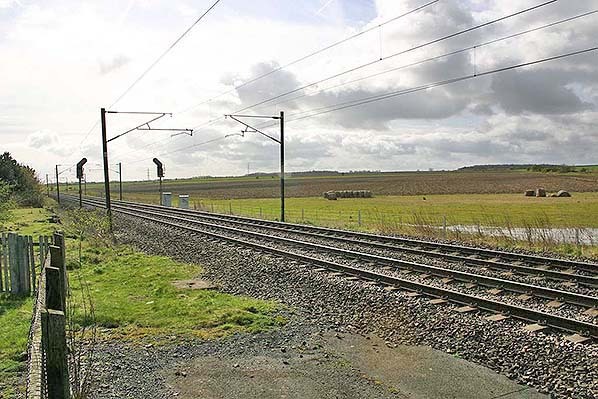 One had a trailing junction with the up line south-east of the level crossing, while the other was north-west of the crossing, having a trailing junction with the down line and a headshunt. Considering that so few potential passengers lived in the vicinity of the station (only 394 in an NER report of 1911) for several decades it enjoyed a frequency of train departures broadly similar to Stannington, Cramlington, Annitsford, Killingworth and Forest Hall. In 1911 only 6,342 tickets were booked at Plessey. NER official figures for 1913 indicate that 22 wagons of livestock were loaded at the station but that there was no other significant goods traffic. In 1923 at the ‘Grouping’ Plessey station was transferred from NER to London & North Eastern Railway administration. The LNER’s major contribution to the station’s appearance was the installation of standard wooden running-in nameboards with relief metal lettering. In winter 1937-38 Plessey still enjoyed a relatively frequent service, but at irregular intervals. However, by this time some of the trains which called at other minor stations did not stop at Plessey. In June 1943 Bradshaw shows the following departures from Plessey; after the outbreak of war the service was markedly reduced, but Plessey did not close, as was the fate of several main line roadside stations further north in Northumberland. In the above table, trains noted [B] travel via Benton. Nationalisation of the railways on 1 January 1948 brought Plessey into British Railways’ North Eastern Region. In winter 1950-51 its train service on weekdays was little changed from wartime, save for an extra morning northbound departure, but in 1950 trains ceased to call on Sunday. This rural station (which had issued only 2,376 tickets in 1936) was unstaffed from 8 July 1951, although ‘Halt’ was not officially added to its name; the change of status probably explains the absence of ticket booking statistics for Plessey in 1951 and coincided with a reduction in its train service. The winter 1951-52 timetable shows only one up departure, to Newcastle, at 8.24am and one down, to Berwick, at 7.50am. The following summer saw a reduction in service at the neighbouring minor stations. From September 1955 Plessey’s solitary departure was northbound at 7.50am on weekdays, which was probably for parcels rather than passenger traffic. The station closed to passengers on 15 September 1958 together with many other minor stations between Newcastle and Berwick. In the winter 1958-59 timetable Plessey disappeared. For some years North Eastern Region timetables had acknowledged the closure of stations and advised disconsolate passengers of the bus companies whose services could be used; but the many closures went unrecorded in the winter 1958-59 book, and the next few editions continued this unfortunate practice. The regional map folded into the timetable had presumably had been printed earlier and still showed Forest Hall, Killingworth and Annistsford, but with Plessey and the other stations that closed at the same time erased. Perhaps the closure of the three which were not erased was confirmed later than their neighbours? Goods traffic was dealt with at Plessey until 2 April 1962. Two months later the signal box was downgraded to a gate box (released by Stannington signal box). The platforms and buildings had been demolished by the mid 1960s. In September 1977 the crossing gates were replaced with barriers, and from August 1979 only pedestrians were permitted to cross the line here. The crossing has subsequently been extinguished. Plessey station, looking north-west from Shotton Lane level crossing c1910. On the down platform a large group of men has assembled, with one on the track; they are, presumably, the station staff and other railway workers. The main building is on that platform but concealed from view by the timber building, far left. The subsidiary building on the right contains waiting rooms and possibly booking facilities. The signal gantry in the distance controls the exit from the sidings on the down side. 1859 1: 2,500 OS map. The station is marked and named (as ‘Plessay’) although it officially opened halfway through the year of this map’s publication. This may be evidence of the station having a market train service prior to appearing in the public timetable. A siding is shown behind the station building, trailing from the down line. 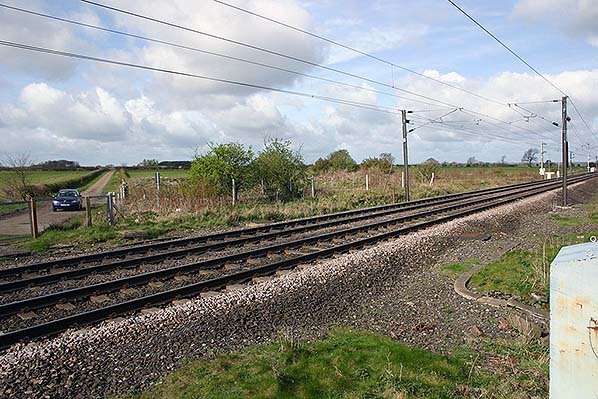 The rural nature of the station’s environs will be noted, with settlements only at Shotton (west) and New Houses (east). 1897 1:2,500 OS map. The station name has been corrected to ‘Plessey’, and an extra siding has appeared off the down track. 1922 1: 2,500 OS map. Plessey station has conspicuously failed to attract further settlement despite its reasonable weekday train service to and from Newcastle. A siding and loading dock have been added south-east of the level crossing, entered by a trailing junction from the up line. The layout of the goods yard has also been changed with a short siding running end on to the dock. 1962 1: 2,500 OS map. The station closed to passengers in 1958 and to goods in April 1962 although it is still named, and its buildings are still in place. Some sidings are still shown although two have been lifted in the goods yard. 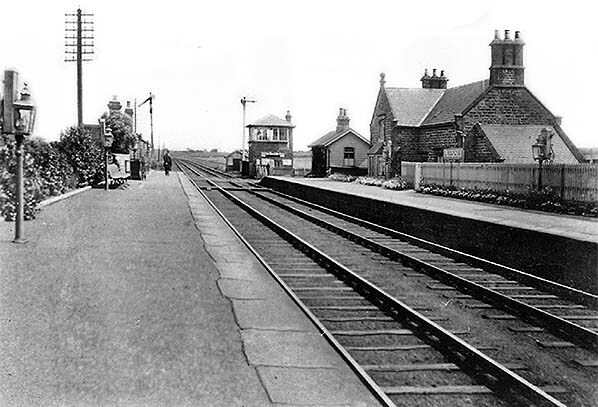 Plessey station, looking south-east from the up platform c1910. The handsome Newcastle & Berwick Railway building is on the down platform and it displays some of the distinctive features of the company’s architecture. It is accompanied by a later timber building, with the signal box dating from the 1870s beyond the level crossing. A small garden is maintained in front of the station building. The nameboard has an unusual style of lettering and is not a standard NER design. The up platform building is on the left, but little detail can be discerned. The station has a series of oil lanterns along each platform, and this type of lighting would survive into the 1950s. A southbound train is signalled. 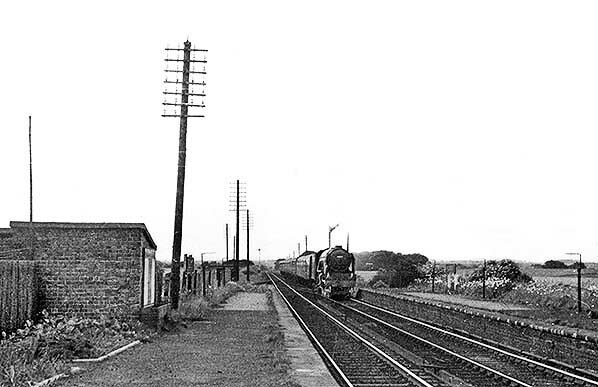 Plessey station, looking north-west along the down platform in 1958. This was the year in which the station closed to passengers, and it had been unstaffed since 1951. The floral display on the up platform looks somewhat unkempt, but its abundance suggests that the photograph was taken in summer or early autumn around the time when the station closed to passengers. No passenger trains had officially called at that platform since September 1955, so it can be assumed that the approaching train will not stop here. The two LNER running-in nameboards can be seen, but the oil lanterns have been removed from their cradles; illumination is no longer needed as the only passenger train calls in daylight hours. The station building is behind the photographer, and the small brick building carries a poster board – perhaps informing passengers of the station’s closure. A Class 37 hauls an up mineral train through the site of Plessey station in 1977, shortly before the level crossing gates were replaced with barriers. 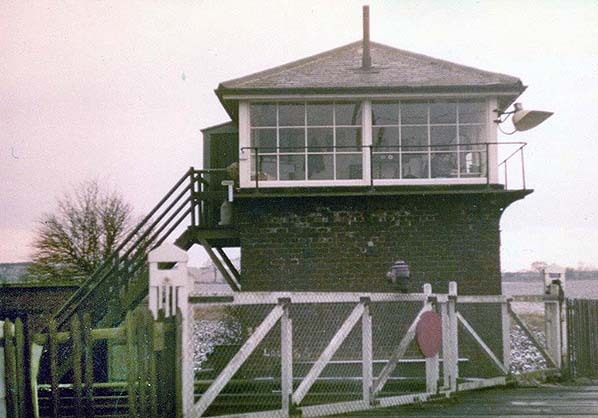 In 1962 the signal box was downgraded to function as a gate box, and would be decommissioned and demolished once the barriers were installed. The station was on the far side of the level crossing. 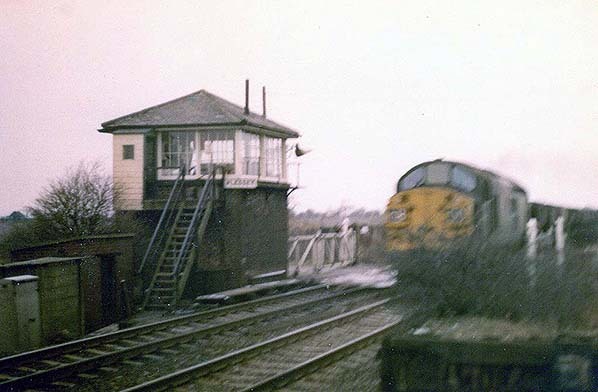 The gate box and level crossing gates at Plessey, looking south-west in 1977. The gates would be replaced with barriers in September 1977 and the box decommissioned at the same time. The site of Plessey station looking north-west from the level crossing in July 1987. The station building formerly stood on the up platform at the left side of the picture. The site of Plessey up platform seen from the former level crossing in December 2005. The site of Plessey down platform seen from the former level crossing in December 2005. The overgrown site of the goods yard is seen to the rear.